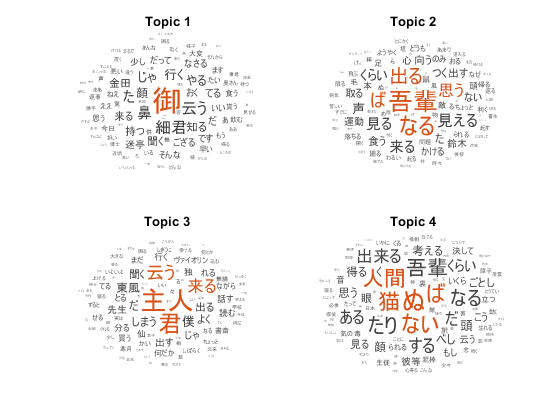 These word clouds illustrate word frequency analysis applied to some raw text data from "吾輩は猫である" by 夏目漱石, and a preprocessed version of the same text data. Read HTML code from a website. Parse the HTML code and extract the relevant data. 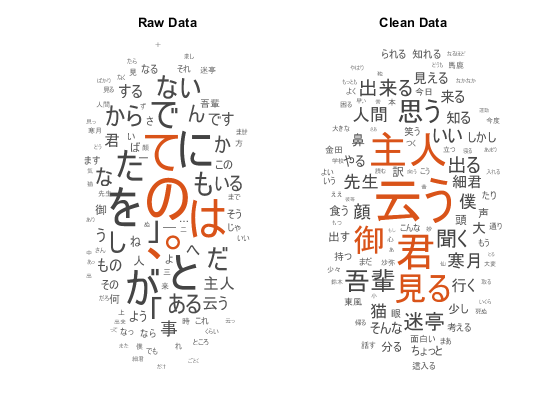 Prepare the text data for analysis using standard preprocessing techniques. Fit a topic model and visualize the results. Read the data from "吾輩は猫である" by 夏目漱石 from https://www.aozora.gr.jp/cards/000148/files/789_14547.html using the webread function. Specify the character encoding of the text using the weboptions function. To find the correct character encoding for an HTML, look in the header of the HTML code. For this file, specify the character encoding to be "Shift_JIS". View the first few lines of the HTML code. Extract the text data from the HTML using extractHTMLText. Split the text by newline characters. Remove the empty lines of text. Tokenize the text using tokenizedDocument and view the first few documents. Get the token details and then view the details of the first few tokens. The PartOfSpeech variable in the table contains the part-of-speech tags of the tokens. 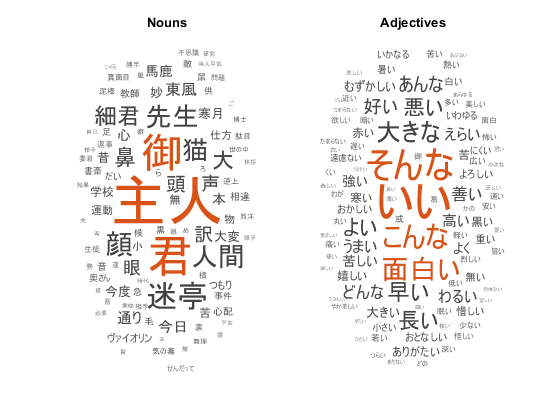 Create word clouds of all the nouns and adjectives, respectively. Lemmatize the text using normalizeWords. Some preprocessing steps, such as removing stop words and erasing punctuation, return empty documents. Remove the empty documents using the removeEmptyDocuments function. Creating a function that performs preprocessing can be useful to prepare different collections of text data in the same way. For example, you can use a function to preprocess new data using the same steps as the training data. Tokenize the text using tokenizedDocument. 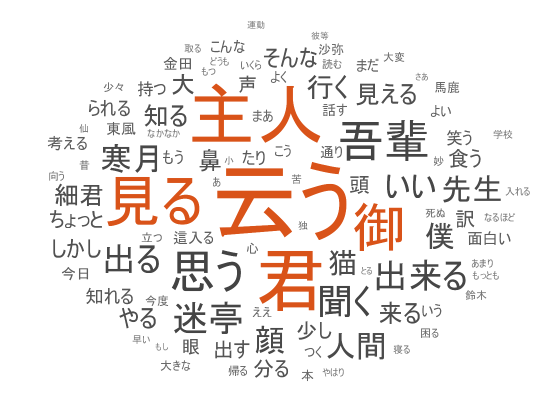 Remove a list of stop words (such as "あそこ", "あたり", and "あちら") using removeStopWords. Lemmatize the words using normalizeWords. Remove the empty documents after preprocessing using the removeEmptyDocuments function. Removing documents after using a preprocessing function makes it easier to remove corresponding data such as labels from other sources. In this example, use the preprocessing function preprocessJapaneseText, listed at the end of the example, to prepare the text data. Fit a latent Dirichlet allocation (LDA) topic model to the data. An LDA model discovers underlying topics in a collection of documents and infers word probabilities in topics. To fit an LDA model to the data, you first must create a bag-of-words model. A bag-of-words model (also known as a term-frequency counter) records the number of times that words appear in each document of a collection. Create a bag-of-words model using bagOfWords. Remove the empty documents from the bag-of-words model. Fit an LDA model with seven topics using fitlda. To suppress the verbose output, set 'Verbose' to 0. Visualize multiple topic mixtures using stacked bar charts. 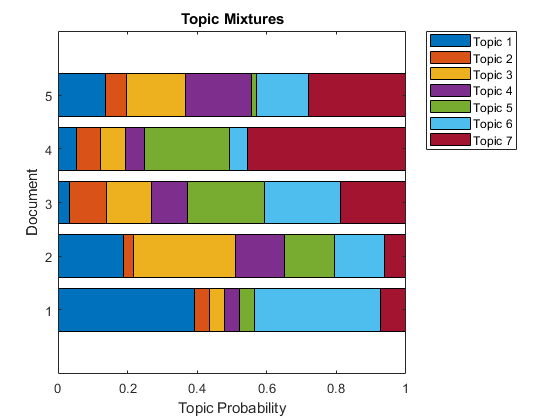 View five input documents at random and visualize the corresponding topic mixtures. % Remove a list of stop words.